Ravens quarterback Joe Flacco was named the MVP of the last Super Bowl. Then, as a reward, he signed a six-year, $121 million contract ($62 million guaranteed) during the offseason. OK, that’s all fine and good, but that doesn’t compare to $648 million. So are you really surprised to see this photo? Rob Owen, a seemingly mild-mannered Maryland man stopped by a local convenience store to pick up some mega-million tickets (the prize is up to $648 million) when the guy behind him jumped to an open line ahead of him. "The guy behind me beat me to the end of the line," Owen told the Ravens team website. "When I got there, I realized it was Joe. I was tongue tied." Flacco was cool, though. He let Owen get back in front of him in line. "I couldn’t have him blaming me when I won and he lost and I didn’t let him back where he was supposed to be," Flacco said. 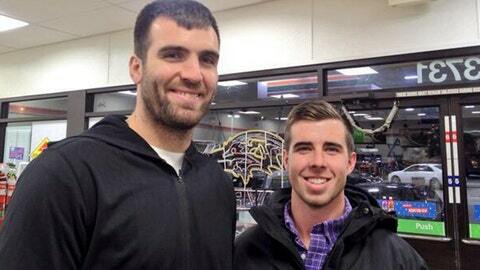 OK, why was Flacco buying lottery ticket in the first place? Wouldn’t you say that he already won the lottery with his big-money contract? "It’s a lot of money, man," Flacco said. "Since I’ve been 18 years old, I’ve always played the lottery when it gets up to a couple $100 million. It’s just for fun." Just for fun. That right there explains it. What’s better than a lot of money? More money.